The Dutch police arrested four suspects on Tuesday on suspicion of money laundering and involvement in selling custom encrypted BlackBerry and Android smartphones to criminals. 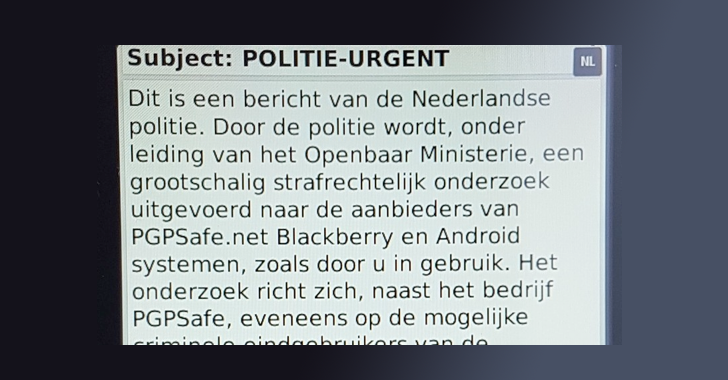 The Dutch National High Tech Crime Unit (NHTCU), dedicated team within the Dutch National Police Agency aims to investigate advanced forms of cyber crimes, carried out investigation and found that the phone brand "PGPsafe" was selling customized BlackBerry and Android smartphones with the secure PGP-encrypted network to the "possible criminal end users." PGP (Pretty Good Privacy) is an open source end-to-end encryption standard that can be used to cryptographically sign emails, documents, files, or entire disk partitions in order to protect them from being spied on. Selling custom security-focused encrypted phones does not involve any crime itself, but Dutch police have discovered evidence, which indicates over the years such phones had been sold to organized criminals involved in assassinations, drug trafficking, money laundering, armed robbery, and attempted murder. Just last year, the Dutch police arrested the owner of Ennetcom, a company that was also suspected of selling customized encrypted Blackberry Phones to criminals. At that time, the police also seized Ennetcom servers based in the Netherlands and Canada, which contain data of encrypted communications belong to a large number of criminals. Later in March this year, the police had even managed to decrypt a number of PGP-encrypted messages stored on the seized Ennetcom server and identified several criminals in an ongoing investigation. In the latest case, the national Dutch police force Politie announced this Wednesday that it had arrested four suspects, including three men from Amsterdam and one from Almere, east of Amsterdam. The Fiscal Information and Investigation Service (FIOD), a Dutch Anti-Fraud agency, along with the Public Prosecutor's Office, carried out raids at multiple places in the northern Dutch cities, including Amsterdam, Koggenland, Zandvoort and Zeewolde. During raids, the police seized a house worth 600,000 Euros, a "mansion" with an estimated value of 1.6 million Euros, around 2 Million Euros in cash, thirteen vehicles, and hundreds of cell phones from phone brand "PGPsafe." PGPsafe claims to sell: "The first PGP-provider which only works with products with the "Highest Grade Encryption" qualification. Therefore, we guarantee the privacy that you expect." "This is the message from Dutch Police. Under the supervision from Ministery, Police have started a large-scale criminal investigation into the providers of PGPSafe.net Blackberry and Android systems, also used by you. The investigation also focuses on potential criminal end users." 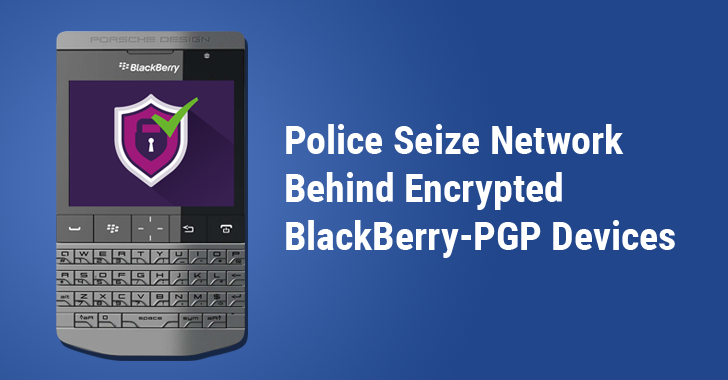 According to the police, PGPsafe with over 40,000 registered customers sells PGP-encrypted Blackberry phones between € 1,200 and € 1,500 each, and transactions mostly took place through cash payments on the public highway. The Dutch police hope to solve nearly 34 criminal investigations in and around the country, pending since 2014, by decrypting PGP-encrypted messages stored on the servers of such PGP smartphone companies. The Dutch authorities are keeping a close watch on companies offering similar encrypted smartphones those are being abused by criminals and terrorists. We have reached out to PGPsafe for a comment and will update this story when we hear back.